University Of Maryland: Ugliest. Uniforms. Ever. At times like this, I realize that sight is overrated. For last night’s game versus the scandal-ridden Miami Hurricanes, the University of Maryland Terrapins had a whole lot of new wrinkles. They have a new head coach, Randy Edsall. They have a new offensive system, an up-tempo no-huddle look. More importantly, they had brand-new uniforms provided to them by Under Armour for their nationally-televised game on ESPN. The combination worked, as Maryland beat Miami 32-24 in College Park, Maryland. 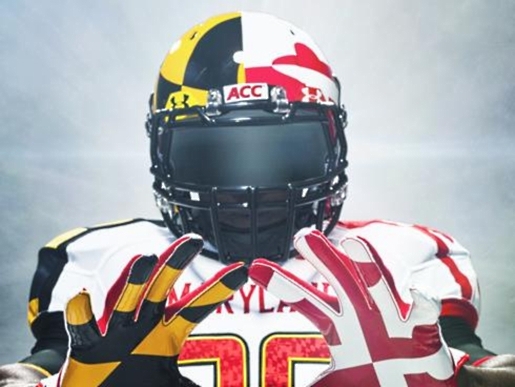 Unfortunately for Maryland, the combination used for their new uniforms was universally hated by both athletes and TV pundits. Yeesh. I’ve never been so glad not to see a football game in my life!